examples of a mickle of good ideas combining to make a muckle of good results! This 2x4ft layout was shown in its early construction stages in Scrapbook #54. It’s a pleasure to show some more photos of its progress, including adding a mickle of excellent details! Other hidden details include the fiddle yards at each end that make operations so pleasurable around Pender Street. The left side (below left) features a removable sector table pivoted at the edge of the baseboard and extending out beyond. 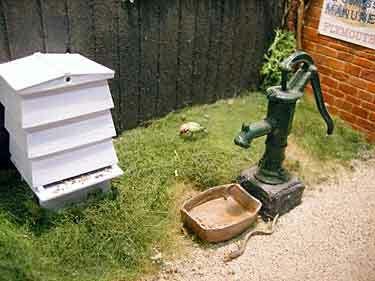 The center photo shows the sector table in operation. At the right end (below right) is a two-track traverser (transfer table) that serves both the two visible sidings and a pair of hidden storage tracks at the rear. 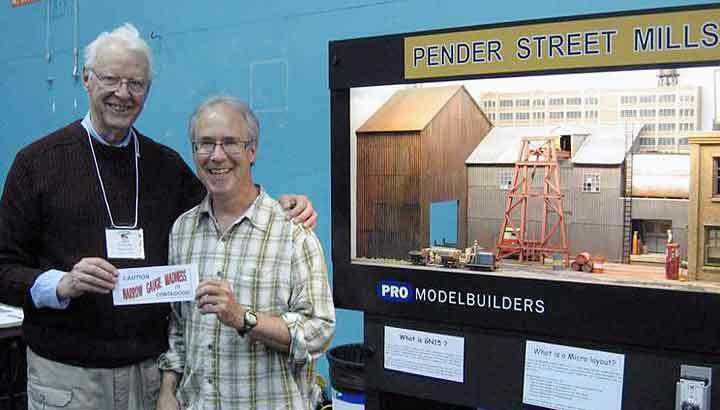 To give you a sense of the size of these G-scale buildings, here’s a photograph (below – photographer unknown) of the two Brians at the Victoria train show. Brian Rudko is sandwiched between Brian Fayle and the layout. 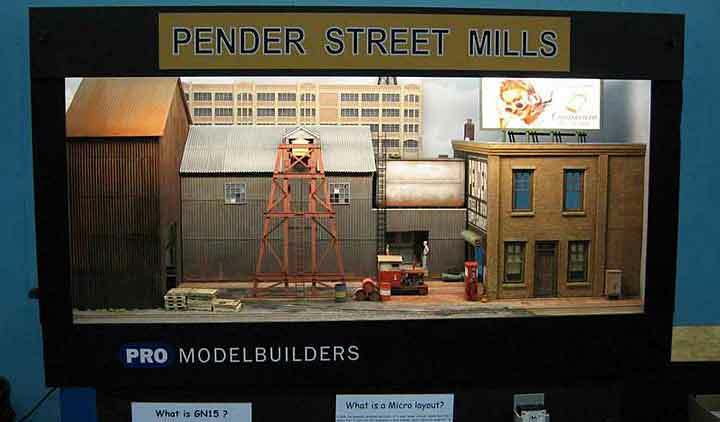 For more examples of his outstanding modeling work, see the Pro Modelbuilders website (don’t miss the coffee cover models!). Gerry reports, “There are two horses, several sheep, numerous cats and rabbits, almost a dozen chickens and a dozen or so wild birds. I’m being cagey about exact numbers as part of the appeal of the layout is the challenge for Kids of all ages to find them all!” Here are a few photos to give you the idea. (Upper left) Near the new beehives from Sidelines models are a snake and a green woodpecker, not to mention innumerable bees (made from dried Earl Grey tea leaves)! 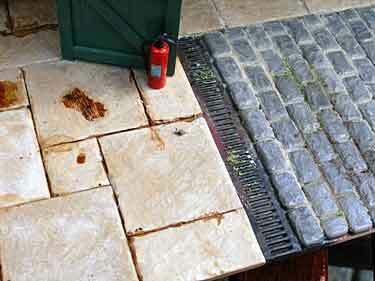 The next photo (upper right) shows the layout’s resident snail, a first in my experience. Below (left) is a more general shot showing many of the zoological exhibits; no prizes for spotting the rabbit and sheep, nor the cat climbing the ivy. 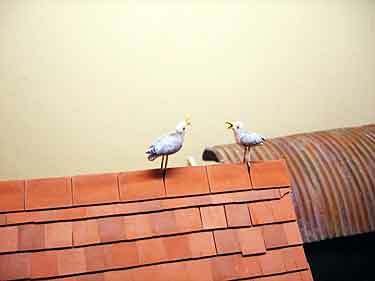 At the right (below) are two of the many birds inhabiting this delightful farm. 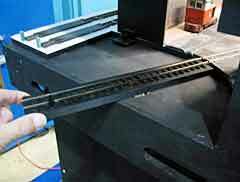 Aren’t G-scale details marvelous? 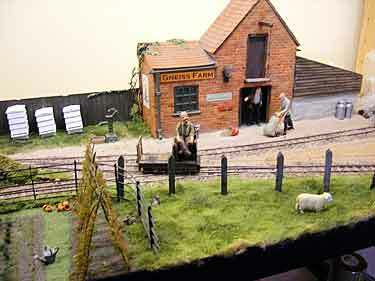 There’s a similar find-the-critter game included in my original Gn15 layout, the Squarefoot Estate Railway. Richard Glover, of the Greenwich and District Narrow Gauge Railway Society in England, sent along a track plan and early photographs of his new layout, Sand Point. 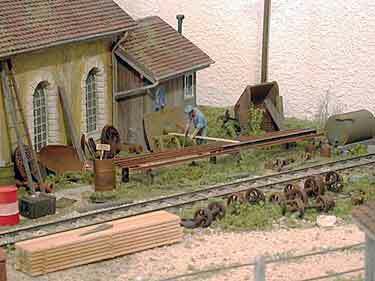 It’s a OO9 (4mm to the foot, 9mm gauge) harbour layout, measuring 105x40cm (41x16in). 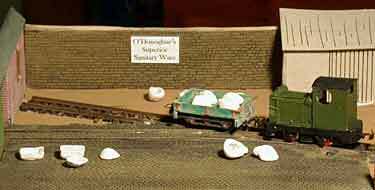 “It’s my first layout built on layers of foamed polystyrene, with a thin MDF skin for protection. It was certainly a learning experience!” Richard comments. 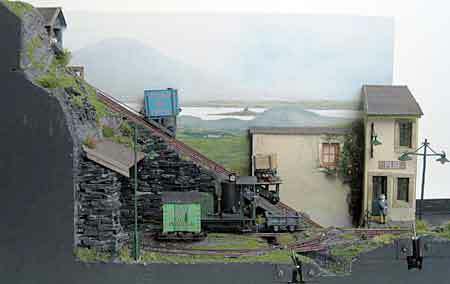 The mickle which may well mak a muckle on this layout is the planned boathouse slipway, which will feature a marine railway to transfer boats from the boathouse to the water. Should provide a most entertaining feature for the model! 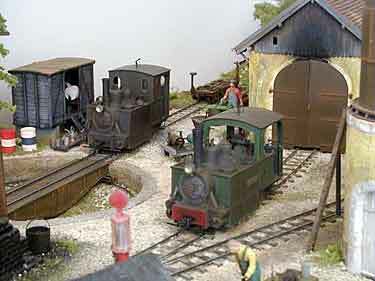 Both Richard and the Society, btw, are involved with ExpoNG, one of the world’s premier model train shows, scheduled for 27 October 2007 in Swanley, Kent, England. 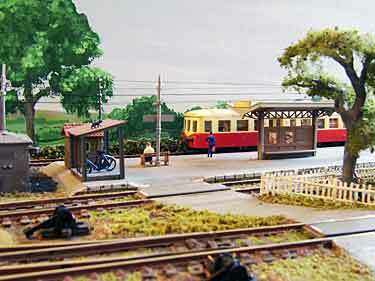 To understand the importance of small details in creating the over-all impression of a layout, try to imagine the station scene (below left) without the well done telephone wires! 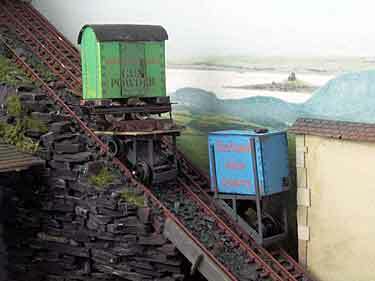 Frequent contributor François Fontana, from Saint Ettienne, France, recently forwarded some photos of his classic shoebox layout, Berlands Slate Quarry (featured in “Shoebox Madness” on this site). This marvelous little line illustrates the importance of selecting just the right details — in this case, the incline and associated trackage — to make viewing the layout a memorable experience. 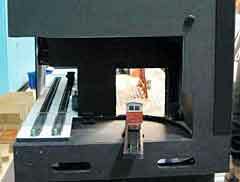 It’s no coincidence that François sent closeup shots of the incline platforms and the rolling stock and counterweight (made of paper! ), as well as the kickswitch and integral approach track. Jon Songøygard, who lives in Arendal, Norway, is one of the most imaginative contributors to this site. 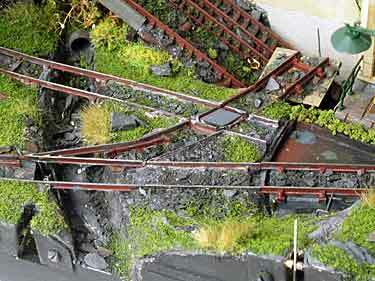 This time, he has put together seven “little things” (dwarfs) and some other practical details to make a working “cartoon” layout, the Snow White Coal Company! The miners come from the Disney movie, “Snow White and the Seven Dwarfs” — their availability as a set of figures from a German company called Bullyland (see photo) makes the layout possible. 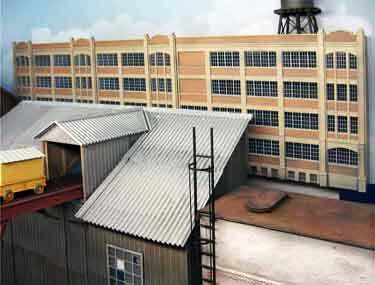 The company also offers the dwarfs’ house as a model, so the setting can be authentic. Prince Charming, also available but not used on this layout, is 10cm tall; assuming his height is six feet, then the model scale is 1:18. So each dwarf is about 1 meter tall. Either 16.5mm or 9mm gauge would work well … Jon opted for HO representing 300mm (12in) gauge, because several small motor mechanisms are available that can easily form the basis of a scratchbuilt locomotive. 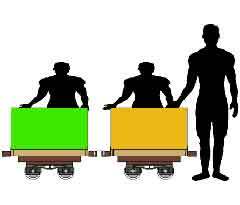 Six scratchbuilt coal cars will be needed, each built on an HO truck [bogie] — the dwarfs’ size relative to the rolling stock is demonstrated in the drawing (top center). For operation, each dwarf will be assigned to a car, with the seventh, most likely Doc, acting as locomotive driver. Jon describes the layout this way: “The track plan is simple (top left). 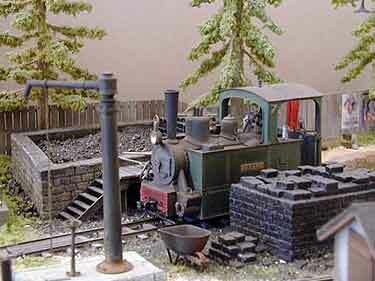 The railroad has a single track in front of the cottage, which makes a turn around the house, enters a tunnel and then spirals down into the earth. The side view drawing (at right) shows a side shaft for each of the seven miners, entering further into the base. This needs not be much more than a hole next to the decoupling spots for the cars, just large enough for the small men to enter. Jon also points out that on his side view drawing the shafts are all on one side of the layout, more ore less above each other. This gives a total height of about one meter (40in). Putting the side shafts half a turn apart would cut the height in half and provide for good viewing from all sides. There are many opportunities for animation on this little layout. 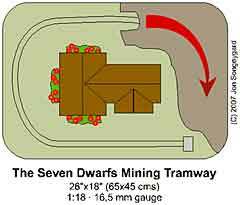 Figuring out a way for the dwarfs to dismount from their wagons and enter the side shafts should provide a challenge, especially if they need to light and carry a lantern as they go. Sound effects are a natural — birds singing above ground, the sounds of picks and grunts below ground, and above all, the dwarfs singing “Heigh-ho, heigh-ho!” as their evening train rises toward home. 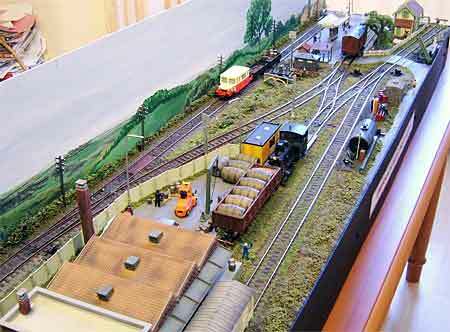 It’s probably not everyone’s cup of tea, but Jon has put together a mickle of ingredients that make a muckle of a layout that can bring joy to viewers from almost any generation! 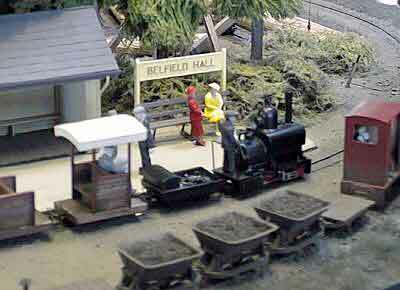 In 1990 Stephen Brown, who lives near London, England, built a small circular layout named Belfield Hall Estate Railway. Its story, plan and some photos are on his website. 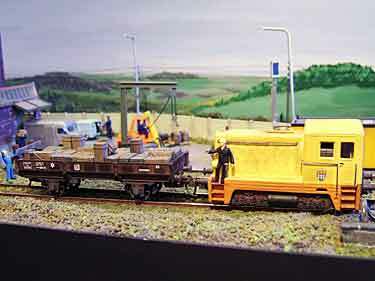 The O9/On18 layout was immensely popular, toured British exhibitions for nearly a decade, and inspired many people to have a go at building a small layout. Stephen’s rotating circular baseboard became a landmark design in the hobby. Stephen recently began a new layout (of which more later). In the process, he found some of his 1990s designs, two of them for circular layouts published in the original BHER article. He thought they might be interesting and new to many readers of these pages, so he sent them to me saying, “Do you think these are worth republishing?” You bet I do! Here they are! 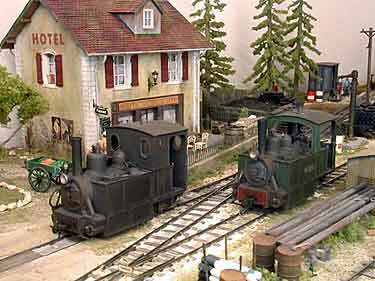 Both these OO9/HOn30 layouts are 36in (91cm) in diameter. 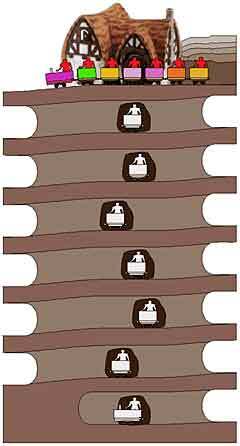 One depicts a mining railway (left), the other a forestry (lumber) line. Both address “the problem of having full and empty stock going aimlessly back and forth around the layout.” Both “solve” the problem (and mak a muckle!) by providing destinations to deliver full and empty cars respectively, as well as ways to allow them always to travel in the correct directions. 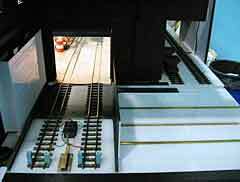 The mining layout uses a concealed two-track sector plate to provide both destination and source for cars. 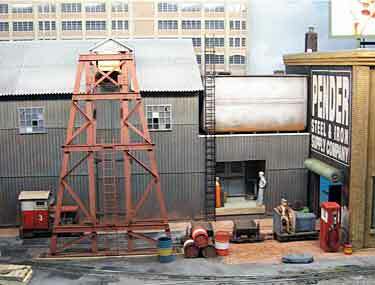 The loco hauls full cars from the mine, pulls them round the layout and shunts them into the processing plant building, onto the sector plate. It gathers a train of empties from the other track of the plate and returns to the mine, where it shunts the empties back into the same sector plate track (which has been secretly swiveled to serve the mine tracks) and picks up the full cars again. Repeat to taste. This technique is very similar to John Armstrong’s familiar “empties in/loads out” designs. The timber layout works much the same way, except the deliveries and pickups are made to run-through sheds, rather than to a sector plate. The pickup and delivery strategies are the same. This layout also allows some “stealth” round-and-round operation. Both layouts use the circular format to very good effect. Our thanks to Stephen for sharing his still-inspiring ideas with a new group of readers who may not be familiar with them. We hope to see more of his new layout in the future. Les Mages is slightly larger than our usual layouts — it’s 3.7m (12ft)long — but I think you’ll agree that it provides plenty of inspiration for small layout builders! 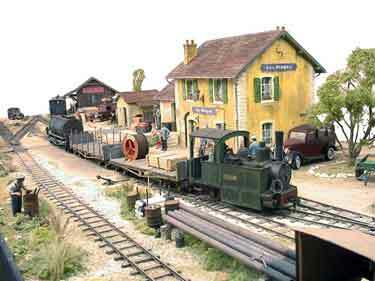 Gilbert Gribi, a well-known European modeler who lives near Lausanne in Switzerland, built this 60cm (two-foot) gauge timber line and equipped it with two delightful little Decauville 0-4-0 steamers. Gilbert excels at modeling detailed scenery, maintaining the difficult balance between providing enough detail to emulate real life without overdoing it and descending into indiscriminate clutter. 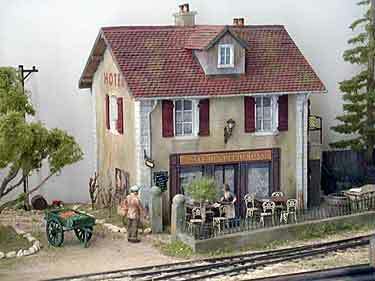 Les Mages is a classic example of how a lot of “little things” can combine to make a stunning layout. In this case, many a mickle does indeed mak a muckle! The photos speak for themselves. Gilbert has many more at his website. I hope you enjoy them all.